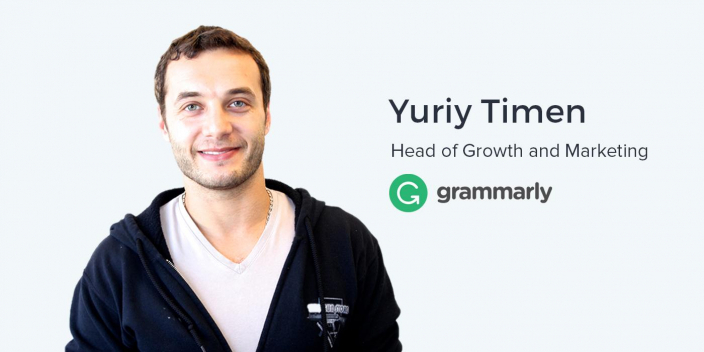 Yuriy Timen, Head of Growth and Marketing at Grammarly, has taken a writing improvement tool and bootstrapped consumer SaaS company to eight million active users over the past five years, making it among most popular and fastest growing Google Chrome extensions. They also offer an in-browser text editor and desktop app. Prior to Grammarly, he ran marketing for DriversEd.com, founded an online dating portal, and started his own full-service digital marketing consultancy. In addition to running the marketing efforts at Grammarly, Yuriy is a contributor at Marketing Land, speaker at Affiliate Management Days, and mentor at GrowthX Academy. He is also an advisor and investor for a number of startups. Articulating the right value proposition to your personas at the right time in the customer journey is a powerful component of marketing personalization. Whether you’re focusing more on features, or whether you’re focusing more on the aspirational value that the product brings to people’s lives, it depends on where people are in their consideration phase. So you’ll notice that a lot of our awareness is generating collateral, like some of those YouTube videos. Even our video strategy uses sequential advertising tactics where the top-of-the-funnel videos are gonna be more aspirational. Advertising copy focused on user testimonials that drives an impressive click-through-rate for your top of funnel ads might not have the same impact for users in the consideration phase. Using a sequential advertising to create a narrative throughout your customer journey is another way to incorporate advertising personalization throughout your marketing funnel. One part of this creating an efficient testing environment to determine when it is better to focus on inspirational or informational content. If you have a high tempo experiment framework set up, is you can test things pretty quickly. And we realized that people – even bottom-of-the-funnel users – actually were pretty receptive to aspirational messaging and in many cases it had beaten out more feature-focused copy. As even though conventional thinking might indicate that aspirational messaging is primarily suited towards users in in the discovery stage, Grammarly also found value in including inspirational value during consideration. Whether it’s ad copy, value propositions on a post-click landing page, email drip campaigns, an ebook, a blog post, the quality of your writing extends far beyond a poorly placed semi-colon and misspellings. I’ve been conditioned, having worked at Grammarly for almost five years, to really pay attention to how effectively something is communicated in written form. It’s not just grammar. It’s about stating things in the most concise, relatable way. Many marketers underestimate the importance of clear and descriptive written communication. Quality writing is practically guaranteed to drive better results. Ander: It’s always a pleasure to meet the marketers behind a product I use everyday, and that’s what I’m doing right now here at the Grammarly office in San Francisco with Yuriy Timen. Yuriy, thanks so much for joining us on the show. Yuriy: Of course, Ander. Happy to be here. Ander: Awesome. Before we dive into your expertise, the secret sauce that you have and other things of that nature, let’s hear a little bit about you – maybe the thirty-second professional journey that led you to here at Grammarly. Yuriy: Yeah, absolutely. So I’ve been doing start-ups, tech, marketing, and growth for probably the last eight years. I started out on the agency side where I kind of got a crash course in PPC affiliate, and a lot of different performance marketing channels. Ander: Good place to start. Yuriy: Yeah, that’s probably the best foundation that you can get. And then as of probably about 2010, I’ve been working in-house. I spent some time at a company called Drivers Ed – we did online driver’s education courses primarily for teenagers. I started my own consultancy, spent some time consulting in parallel. Prior to that, I actually started out in finance. I had sort of a year and a half to two year stint out of school in finance, then I realized that that wasn’t for me. Ander: As a number of people sometimes do. Yuriy: Right. A little bit too rigid and not a ton of room for creative problem solving which is, sort of, what I love probably the most about tech and about start-ups in particular. The way I ended up at Grammarly, actually, is that they were one of my consulting clients. So I did not, think or plan to join the company or the team full-time. I spent about three to four months consulting for them and that really gave me an opportunity to understand the team, to understand how unique and powerful the product was, and that we have a product that meaningfully impacts people’s lives, which is non-trivial and important to me. I also understood the huge potential. There are north of two billion English writers around the world and we believe that our product can and should be used by all of them. This was back in probably late 2011. So in 2012 I sort of made the plunge and came on board. I was essentially the first non-technical hire, the first business hire. Also the first San Francisco hire. I co-opened the San Francisco office with our CEO. Ander: So, you’ve really built this marketing operation from the ground up. Yuriy: Yeah. I’ve been very fortunate to be put in that position. Ander: Sure. Let’s talk about Grammarly and what it is… I talked a little bit about it in the introduction … You have Fortune 100 companies on board and lots of universities are using your product. What else can you tell us about Grammarly? Yuriy: Yeah, absolutely. Grammarly is a smart writing application or a writing improvement tool. At the core of what we do is grammar checking. We’ve built the world’s most advanced grammar checker and automated proofreader. But we’ve also started venturing beyond objective ‘right versus wrong,’ you know, ‘affect versus effect,’ ‘put a comma here.’ We’re now doing things like suggestions around clarity, around readability, around effectiveness, around vocabulary usage, around tone, style, etcetera. We’re using deep computational linguistics machine learning to understand massive amounts of data to really help people improve their writing in a variety of ways. We like to think of ourselves as sort of a smart writing application for all levels of English written proficiency. Ander: As somebody who came here and helped open your office in San Francisco, I imagine you experimented with a few growth channels right off the bat. When did PPC and digital advertising really come into the mix? What was the story behind that? Yuriy: Great question. When I joined Grammarly we had already been pretty active in paid search and dabbling a little bit in display. That was sort of our bread and butter and pretty much our only digital paid channel at the time. We had some consultants running it so one of the first things that I did here is took it in-house. That was priority number one. We were spending quite a bit there already. Obviously nowhere near to where we are now, but still. So we had already had some basic PPC stuff in place but a lot of our campaigns needed to be audited and there were kind of a lot of expansion opportunities. Ander: What were some of the observations that you made kind of right off the bat and maybe some of the quickest wins that you found when you found opportunities for optimization? Yuriy: You’re taking me way back here! From what I recall, there were a lot of opportunities around campaign structure – making sure that we have the right keywords matched to the right ad groups, and cutting out a lot of excessive spend. We had a consultant running our account without a ton of guidance and there wasn’t a lot of oversight from our end, so there was a lot of excessive spend. That was something that we needed to kind of get under control, as well as refreshing our creatives, and getting a testing program in place where we’re regularly and consistently streamlining copy tests, targeting tests, etc. We established a relationship with an account management team at Google and Bing, letting them know that they have a point of contact for when they consider for all the different betas that are coming out. At that point our account was already pretty sizeable to garner that kind of attention. It was just that we didn’t have a DRI internally to drive that. Ander: Yeah, I totally understand that. And you mentioned something that I would love to talk about, which is A/B testing. We all know, as marketers, how important it is to always be testing, looking out for those opportunities to improve your conversion rates or whatever your KPI is. And it’s actually something that you’ve written about. As far as the ROI on the time that goes into a test, what would you say is one of the most important things to A/B test when you’re running PPC on AdWords? Yuriy: I think any kind of testing program or testing plan needs to start with kind of a baseline analysis. It’s hard to tell where the biggest opportunity may lie, whether it’s on the app copy front, whether it’s on the post-click landing page front, right? You really need to understand your entire user funnel and see where the biggest potential gaps lie and if you have strong hypotheses around how to improve those gaps. It’s not ‘one size fits all’ where you always start with app copy or start with post-click landing pages. It really depends. Ander: You have to test based on your hypothesis. Yuriy: If I were to come into kind of a new company or a new PPC account, I would first want to do a clear audit and do a heuristic analysis to really understand and lay out all the steps of the user experience. Where do we feel that people are converting at an appropriate rate or an adequate rate and where do we believe there is the biggest drop off? I can give an experience from Grammarly in particular. Ander: Sure. Stories are great. Yuriy: Since we launched freemium, which was about a year and a half ago – prior to that we were sort of a premium only product and now we have a free offering as well – we had a funnel that essentially asked you to install the product, specifically the browser extension, and then afterwards we asked you to create an account. That allows you to get more out of the product than if you were using it anonymously without that account. And, we had a challenge. We saw a pretty big drop off rate between the install and the sign-up form. Once we kind of analyzed our funnel we thought that that’s where the biggest opportunity lied. And when you see that you ask yourself if there is there a strong hypothesis for why that may be the case. Any time you go in with a test you need to have a strong hypothesis. We figured that we’re not really communicating clearly enough why people need an account, right? People are accustomed to installing browser extensions and just being on their merry way, so why exactly are we asking for an account? So we started constructing different value propositions and different messaging around why an account creation is an important part of the process. We learned that because we did a thorough analysis of our entire funnel, to understand where the biggest gaps are. Ander: And, getting a user from the free version of the product to the paid version… That’s kind of the golden question. Yuriy: That’s how we make money. Ander: Exactly. Very important. How much of articulating the value proposition in an accurate way, a way that was conversion-friendly, how much of that actually took place within your ads and the subsequent post-click landing pages? And, how much of that was also towards the very top-of-funnel instead of retargeting? Yuriy: Great question. So, the nature of our product is such that, to a large extent, it sells itself. Ander: I can certainly agree with that! Yuriy: Yeah. It’s a persistent product, right? It’s there with you – you use your browser, you write emails, you post on social media every day, and Grammarly is there. And so for us the first key was making sure that the value of premium is communicated clearly within the product. The product is where we have the most time with the user. Yuriy: Right? So, how do we communicate the value of premium in a way that doesn’t take away from the free product, but also consistently reinforces the value of the premium product? That’s where we focused. But we also supplement our in-product messaging with email and with retargeting as well. We do have retargeting campaigns that target free users, specifically with the premium product. Ander: One of the things I have actually seen – and I imagine this might be retargeting – you have these excellent YouTube ads running right now that are just awesome and when I was working for myself and I kinda had my eyes open for the right full-time opportunities, there was this one I saw that I believe was really geared towards job seekers for improving the writing on their resume or cover letters or whatever it may be. What kinds of interesting results as a result of running these ads? Yuriy: Yeah. Video advertising has been really, really crucial for us. It’s performing well as a direct response channel. It’s also providing a substantial brand lift. We’re seeing that there’s an overall broader brand awareness of Grammarly. We’ve seen that reflected in things like brand searches, which we’re then able to capitalize on with ads, as well as with organic listings. So yeah, I think video is definitely something we plan to double down on. Ander: Yuriy, given the nature of Grammarly’s product as a writing improvement tool I think it’s interesting to hear from someone who works for this company and also has such a deep knowledge of digital advertising and growth marketing… How do you find the right copy to your ads and your post-click landing pages? How much of it is A/B testing? How much is persona development? Where do you start? Yuriy: Absolutely. I think it’s sort of an intersection of multiple disciplines. On the one hand, brand and strategic thinking play a huge part because, in our case, for instance, we see ourselves as a lifestyle aspirational brand. We want to really focus on benefits that we bring to people’s lives that may not be immediately associated with a product like ours. So, we are trying to break out of the utility category and be viewed as a lifestyle aspirational product. Think of it as like a Fitbit for your writing. Ander: Yeah, and the nuances of that, as far as language is concerned, and how you’re using that in a lot of your top-of-funnel marketing – especially with ads and then your subsequent post-click landing pages – it’s really interesting. Yuriy: Yeah, you know, one big evolution for us is that before our copy and all of our copy experiments were more feature-focused. Ander: Oh yeah. I remember that. Yuriy: We correct for 250+ types of errors, you get vocabulary recommendations, etc. We would, sort of, test a lot of features. And we were hesitant about testing more aspirational messaging such as ‘Achieve better results’ or ‘Advance in your career faster’. More results-based messaging. We felt that it wasn’t gonna be relevant enough and people were not really going to relate to it. But with the power of testing, especially if you have a high tempo experiment framework set up, is you can test things pretty quickly. And we realized that people – even bottom-of-the-funnel users – actually were pretty receptive to aspirational messaging and in many cases it had beaten out more feature-focused copy. Ander: It’s really interesting to think about when you’re going from this feature-heavy copy to really talking about aspirational stuff. What surprised you or what were some of the first things you noticed once you guys made that change? Yuriy: Well, for one, we noticed that in many cases our worries were unfounded. We did not see a drop off in conversions or in performance that we had thought we would see. We also learned the power of sequential advertising. Whether you’re focusing more on features, or whether you’re focusing more on the aspirational value that the product brings to people’s lives, it depends on where people are in their consideration phase. So you’ll notice that a lot of our awareness is generating collateral, like some of those YouTube videos. Even our video strategy uses sequential advertising tactics where the top-of-the-funnel videos are gonna be more aspirational. They’re gonna show somebody who’s really succeeding professionally or succeeding academically and having this high level of confidence. I think, the power of sequential advertising is something that we’re really able to hone once we started experimenting with aspirational messaging. Ander: Do you think there are enough companies taking this approach right now? Because, I completely agree. Sequential advertising, especially with how you aspirational vs. feature focused messaging is a tremendously powerful form of personalization. Do you think that this is an under-utilized approach that could be taken more often by people running digital ads? Yuriy: Two things – I do think it’s fairly underutilized. I also think that, when it is utilized, there is a fair number of advertisers out there who understand it conceptually but have a hard time really measuring it. So they’ll do it just based on faith, right? For instance, we need to invest in video because that’s how you drive brand awareness. Ander: Because everyone tells us to. Yuriy: Right? But how do you actually tie it into conversions? How do you tie it back to conversions? How do you measure it? How do you justify it? For a company like ours, it’s in our DNA. We’re bootstrapped, so we’ve always had to focus on profitable and responsible growth. It wasn’t ‘growth at any cost.’ That’s sort of been a forcing function. How do we balance being bold and audacious while still keeping an eye on our life? I would say that fortunately, yes, we’re bootstrap, but we’re fairly successful so we have built up some appetite and tolerance for running tests. When we test things that may not work, we can stomach it. Those kinds of things. But we still approach it in a very, data-driven way. Ander: Yeah, and you’ve been doing it since the beginning too, which makes it much easier to continue doing as opposed to starting a test once you’ve got this whole thing already built up. Ander: Back to the space as a whole… what do you think is coming to advertising? What’s coming to PPC? What changes are we gonna see in the next, maybe, five years? Ten years, even? Yuriy: Yeah. I think, you know, you’re seeing a lot more top-of-the-funnel and awareness channels including paid channels. I think video advertising is growing and the spend in video advertising is growing really quickly. What you’re going to see with video, and what we’re seeing, is that you’re able to generate literally millions and millions of impressions. This information is publically available. You can go into our YouTube account. You can look at some of our ads. We have a couple of ads with north of 80 million views. Just for comparison’s sake, Pepsi’s most-viewed commercial on YouTube has, like, 40 million views. Ander: Wow! Wow. Really interesting. Yuriy: It’s the Dr. Drew… We have Kyrie Irving playing, like, an old guy. Yuriy: But yeah. My point is that when you’re generating that kind of awareness as you can with video, you’re gonna set off kind of like a tsunami because a lot of people have seen your brand. What do they do after that? They may search for it. They may encounter it somewhere else and now we’re ringing a bell. When you have those kind of awareness channels with such a broad reach, it’s important to really understand multi-touch attribution. I think that there’s gonna be a lot of activity around multi-touch attribution, cross-device attribution. We’re definitely living in a multi-device world. Those are the things that I know they have been saying have been coming for a while, but a lot of people still have a really hard time understanding cross-device attribution and understanding multi-touch attribution. Ander: With the knowledge and expertise that you have is there some sort of product or some process you’d like to see released to solve this cross-device and multi-touch attribution problem that doesn’t currently exist? Even if it’s unrealistic with our existing technology. Yuriy: Yeah, if we go really, really deep into fantasy land, I’d wanna see some kind of multi-touch tracking that accounts for offline as well as online. Ander: Like billboard advertising, traditional advertising? Yuriy: Yeah. Maybe some kind of chip that’s implanted or maybe it’s some kind of wearable device… I think some underlying technology already exists but it just has not been mass produced. But that’s something that’s, bugging us data-driven marketers quite a bit. It’s like word of mouth, how do you measure it? Yes, you can survey people, but that’s probably not the most reliable way. Ander: Is Grammarly actually running billboards right now? Yuriy: No. But it is something that we may look into in the not-so-distant future, as well potentially doing TV, which is another, tricky one. Ander: Yeah, I mean, the thing is, I see so many of these ads on public transit busses here in San Francisco and after enough time, sometimes I actually remember these companies, you know? Ander: It does happen on a somewhat regular basis. Yuriy: Yeah, I mean, you know, with something like a billboard, you’re looking often times to measure lift. At least that’s sort of like the best practice. – You want to try to pick certain geographies. Fairly narrow geographies and run a really high-frequency campaign in those geographies and see if there is a lift in conversions or visits or activity coming from those zip codes. That’s kind of the conventional wisdom around that. But, you have to pick a geography where you’re likely to see that lift and for that lift to be measurable. And you’re also going to have to probably invest quite a bit to create that high frequency during that time period, whether it’s billboards or TV ads. Ander: Well, I’m going keep an eye out for the billboards if you ever start running ads on the public transit here in San Francisco. Ander: Let’s turn back to Grammarly a little bit and what you and your team are so focused on here are … writing and written content. Do you think that marketers are missing out on opportunity because of poorly-written content? Because we all know it’s that horribly written content is out there. Yuriy: Yeah, I mean obviously I’m pretty biased, because I’ve been conditioned, having worked at Grammarly for almost five years, to really pay attention to how effectively something is communicated in written form. It’s not just grammar. It’s about stating things in the most concise, relatable way. I do think that the quality of written content is something that a lot of folks underestimate, especially folks working in content and working in marketing. We’ve done a variety of studies and joint studies with different companies that prove that better writing leads to better results. We did a joint study with Redfin that showed that listings that are written more effectively that have fewer mistakes tend to sell quicker. We’ve done a study using LinkedIn data showing that folks with better written profiles seem seem to positively correlate with faster career ascension. There is definitely a lot of data out there. We view that our purpose in the world is really to educate the mass consumer on the importance of effective written communication. And to your point, marketers are no different. We do think that marketers are a huge target segment for us at Grammarly and can benefit a ton from our product, which is free, by the way. Ander: Yeah, exactly. It’s free and as someone who uses it, and as someone who is a marketer, I highly, highly recommend that you certainly check that out. On that note, right before we wrap up, how can we as marketers and the audience of this podcast check out Grammarly? We like to ask everybody who joins us as a guest on this podcast, what can we can as the audience do for you? Yuriy: That’s a great question. Two big things: one, we would love for them to give the product a shot. I think that it can really improve their lives in a meaningful way. But also we’d love to learn from them as far as what they like about the product, what they don’t like and what we can improve. I think marketers – and I’m assuming that’s the majority of the audience here – is a market that we really plan to focus on and content creators in general. The more qualitative feedback we can get, the better the product will be long term. Ander: And on that note, if people do want to give you that qualitative feedback, is there a specific way that they can reach out? Yuriy: Yeah, absolutely. I think the best way to do it is through the support icon right in the product itself. And the product team has a very strong streamlined relationship with the support team. Yuriy: Yeah. All of that feedback gets funneled in the right place and prioritized accordingly. Another thing is that we’re growing very, very quickly. We’ve just crossed 8 million active users on Chrome alone. We’re probably one of the fastest, if not the fastest, growing Chrome extension. We’re the only extension at our scale that has a five-star rating on Chrome. That’s pretty impressive. We are growing very quickly. We’re a company of a little over a hundred across two offices – Kiev, Ukraine and San Francisco, California. We’re hiring and we’ll probably have close to 30 openings right now – five on the marketing and growth team alone. So check us out on grammarly.com/jobs. You could also shoot me a note directly if you’re interested at yuriy@grammarly.com. Ander: And I will say just from my very brief observational point-of-view, the view in this office is pretty spectacular so you’d be lucky to be here! Yuriy: Yeah, it is pretty sweet. Ander: Cool. Yuriy, once again, thank you so much for joining us on this podcast. Cheers to better marketing for you guys and everybody else out there and we hope to see you around soon. Yuriy: Thanks for having me, Ander. It’s been a pleasure.